Crafting a rug is a complicated process that can take several months or years to complete. However, with advances in manufacturing, that time has dropped significantly, and machine-made rugs can be more quickly assembled. There are two types of rugs that exist in the marketplace today—machine-made and handmade. The differences between the two may appear small at first, as they’re made from similar materials, but become obvious upon inspection. Machine-made Oriental rugs became popular after the Industrial Revolution, when many handmade methods underwent a transformation into mass-production. These types of rugs, fastened to large machinery looms, are created with a single pattern in mind, producing dozens, or even hundreds that are essentially the same. Because of this, their rarity and artistic character are compromised, as they lack ornate crafting. 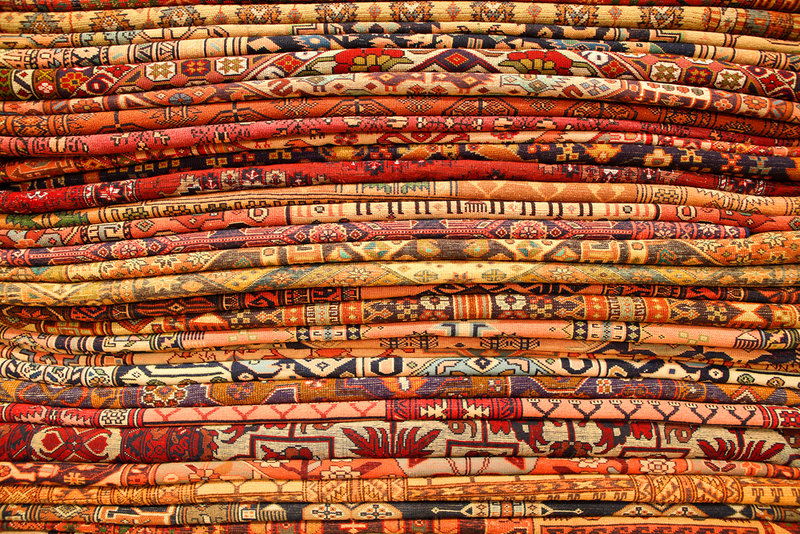 Quickly produced and less expensive, they are far less valuable than handmade rugs made from the same materials. Handmade rugs have an intrinsic value derived not only through high-quality threads, but from the weaver themselves—the art of rug-making is sustained by the talent of each artist. Appreciators of technique view their work as a multiplying of the rug’s overall value, both economically and culturally. This is why handmade rugs have maintained a tremendous presence in the global market in spite of the speed of machine-made processing. Crafting begins with a pre-drawn design or pattern crafted to express an idea, event or request from the purchaser. These are sometimes called “cartoons” that become the diagram the weaver works from during the rug’s formation. Creating the Oriental rug itself begins with selecting the materials. Typically, the threads are made of wool or silk and have been dyed using everything from modern colorants to palettes created from more traditional, vegetal materials that are insect or root-based. Oriental rugs are then fabricated by a series of knotting and weaving techniques which vary slightly in different areas of the world. Weavers begin with a warp of cotton or wool which serves as the foundation of the rug, also acting as a tensioner to give the threads a strong backing during their manufacture. The weaver will then tie knots into the warp, later incorporating the dyed threads into the knotting, ensuring that a proper weave is established before pounding it into place with a steel comb. This is repeated hundreds, even thousands of times, before a rug reaches completion. Each thread is placed specifically in order to preserve the integrity of the piece and make certain that the end result is a striking rendition of the original design. Whether the final design will be a Kashkaie or a Khorossan, the steps toward completion are the same. When completed, the warp will either be cut from the ends of the rug or tied into fringe that surrounds a finished piece. The Oriental rug is then sold or used by its creator, adding a unique piece of complex artistry to various degrees of living and social spaces, and continuing a tradition passed down by generations.